The Athena 'Tuckable' Custom Leather IWB Holster by Soteria Leather is known for deep handgun concealment. This leather holster is the Athena Custom Leather Holster, featuring a 'spring steel clip' that allows you to 'tuck' your blouse or shirt while concealing your IWB Holster. The Athena 'Tuckable' IWB Holster, offers the same versatilty in a concealed carry holster as the Athena. This custom holster can be worn as an appendix carry holster, with or without a belt, and clipped in your handbag to create a pistol purse. 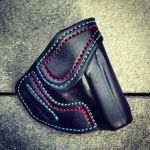 This custom leather holster can also be a boot holster. Even though the Athena 'Tuckable' concealed carry appendix carry holster can be worn by men and women, this handgun holster is very popular with women. Regardless of shape or size, women find the Athena 'Tuckable' makes it easy to carry a concealed weapon, with almost any style of clothing. Constructed of leather from American cattle. 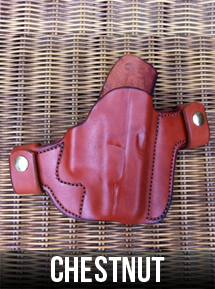 Appendix carry or Cross-draw holster is to be worn on either side of the front zipper. For comfort and function, wear this gun holster so the gun rides as close to the waistline of your pants as possible. 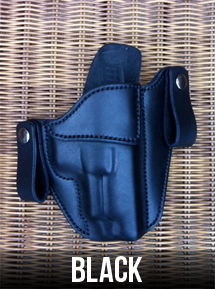 This concealed carry holster works best for smaller handguns, such as .380's, as well as small 9mm and .40's. Can be used with a 1-1/2" belt. Can be worn as a boot holster. Can also be clipped securely into your purse. Available in Right Hand or Left Hand designs. Make it 'yours' with leather and thread options. 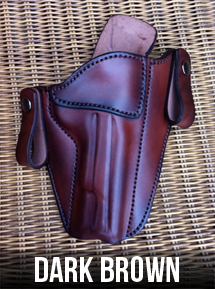 Your custom concealed carry holster will ship in eight to eleven weeks. Athena was the Goddess of wisdom, warfare, battle strategy, and heroic endeavors. This IWB conceal and carry holster is available for the following weapons, AND MORE. Please check the options list.